In previous columns, I’ve explored the everyday activity of drilling, touching on drilling boards using hard waxes to hold multiple parts while soldering as well as a method of moving a misplaced drill hole using an engraving tool. This month, I’d like to focus on drill bits and how to best use them. The most common drill bit is the twist bit, which features spiraling flutes running up its shaft. These channels guide debris away from where the drill is biting and prevent it from jamming and breaking. However, when drilling a pearl or a hard material such as steel, the powdery debris can be sticky and pack the flutes, which can result in the bit jamming and snapping off. In these cases, it is best to drill forward a millimeter before backing out the bit so the debris packed in the flutes can be removed. As the bit’s channels remove debris from the hole, the dust and filings can sometimes pile up on the work surface around the hole, obscuring the view of what is happening. To easily remove debris without having to halt drilling, some jewelers will hold a straw between their lips and blow at the drill hole to keep it clear while they work. One trick I like to use is to create a propeller on the drill bit so that any dust is blown away. 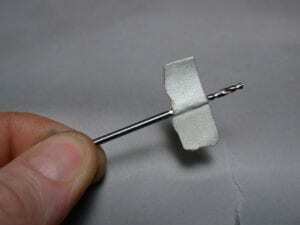 To add a propeller to your bit, cut a small strip of tape or label stock and fold it in half (sticky side to sticky side) with the drill bit in the middle. When your drill is running, the small propeller will act as a fan and keep debris away. In addition to drilling holes, twist bits make superb tools for creating flat-bottomed holes or channels when carving wax. To do this, grind the end of the bit flat across, then tip the bit to a 90-degree angle and sink it into the wax. When the bit reaches the desired depth, hold the bit vertical so it will no longer cut deeper, only sideways. This allows you to create a flat-bottomed hole in wax for a bezel-set stone. Once the hole is made, carve the wax surrounding it to create the bezel wall. a standard twist bit in a standard #30 handpiece takes perhaps 10 to 15 seconds, while changing a step-down bit in a collet takes only 3 to 5 seconds. Over the course of a year, this slight difference could amount to hours of production time being saved. Regardless of the type of drill bit you’re using, it is always a good idea to use a lubricant when drilling. You can use a drop of oil, though I recommend a mineral oil such as one used on babies rather than a standard machine oil because there’s less chemical exposure. You can also use beeswax, which can bind the metal debris into a paste that reduces the dust in the air and makes the debris easier to clean up. There are also silicone-based waxes such as Burr-Life that work very well, do not leave debris behind, and come in both solid and liquid forms. In a pinch, even hard or liquid soap will do. Despite any jeweler’s best efforts, inevitably a drill bit will break off in a jewelry piece during drilling. As often will be the case, the bit will be small, stuck in an awkward spot, and sunk deeply enough into the metal that one cannot grip it to pull it out with pliers. When that happens, first try to knock it out gently from the other side using either an old drill bit of the same size or a thin, tapered prick punch. If this fails, simmer the work in a concentrated solution of alum and water. (Sulfuric and battery acids will also work but alum is the least dangerous and readily available at most grocery and drug stores.) In about 20 minutes the drill bit will be reduced to a black powder, which will fall out of the piece. Just make sure you do this in a Pyrex or CorningWare container, as the solution will create holes in a steel pot. Originally published at MJSA's award-winning flagship publication, MJSA Journal. MJSA Journal, The Authority on Jewelry Manufacturing is devoted solely to the manufacture and sale of fine and fashion jewelry. No other publication devotes as many pages per month to new manufacturing techniques, bench tips, business and marketing strategies, and time-saving technologies. That's why our readers, from volume manufacturers to manufacturing retailers, custom designers to bench technicians, rely on MJSA Journal to Make It.